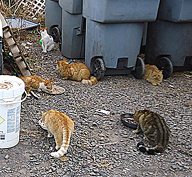 these cats are considered "Community Cats." For whatever reason they ended outside, to survive on their own, they don't need an "owner" to make their lives worthy. They still have a right to live out their lives, as peaceably, as possible. And we, as a community, need to be ethically responsible for them. Cats were bred, and evolved, from wild animals, outside animals. We wanted them to stay close, to us, as rodent control and as companions. It is only within the past 50 years or so, that parts of society decided that cats should only be inside someones home, ignoring evolution and the desires of other groups of our society.. Yet, in our society, because of cat haters and actually cat lovers who insist cats be inside, over 99% of cats brought into almost all local, tax supported, "shelters" are killed, and it has become the norm. While most of us think that is absolutely horrendous, most of us turn our heads and ignore it, which, in itself, is horrendous! If your cat was caught in a trap and brought to the local "shelter" with different people there, kept in a tiny cage, would it be friendly and considered adoptable within 24 hours? If not, it would most likely be killed too. There are actually several groups, and sub cultures, in our society that want cats around, as they have been forever, and don't necessarily want them indoors. Is it right to tell them they can't keep a cat like this, or if they do they very likely would see it killed if brought to the local "shelter". First off, make sure that your cats and all the cats you see are spayed or neutered! Talk to them. Talk to the businesses. Ask them if these cats are fixed. If not, explain how important it is to prevent more from being born, that most will be killed if caught, or could suffer immeasurably while trying to survive on their own. Many local groups and shelters offer programs to help get these cats fixed, often at no cost to those who bring them in! If you can, find out which do, and have that information available to those you talk with. If you can help more would be even better! Several areas need responsible people to be in charge of TNR colonies. These people oversee certain areas, making sure all cats in that area are fixed, and relatively healthy. They watch for new cats and if a new cat appears, they arrange getting that cat fixed and checked asap. These caregivers/caretakers usually also make sure there is fresh water available and food as needed. Colony caretakers are needed everywhere, in all aspects of the position. If you can give any of your time, whether full time or just a couple days a month would be greatly appreciated. Contact your local cat group or shelter and let them know you would like to help. Unfortunately, most caretakers pay out of their own pocket, for food and sometimes medical necessities too. This needs to change! As an ethical society, the community needs to take responsibility and make funds and necessities available for these cats. We also need to see actual government groups established for the well being of community cats. It isn't right that many communities/governments allocate money to kill homeless animals, but they don't allocate money to take care of live ones! Our society shouldn't force individuals to pay for helping these cats themselves and giving their time constantly for a community issue, with the ultimatum being, if they don't, the animals will be killed, and with tax payer money. The responsibility for their care should fall under all "civil" communities, cities, states, governments. Something everyone can do is write letters and talk with local government officials about making legislation and funding in favor of these community cats and those who take care of them. Click here for Maui Government and Media contacts. Truly feral cats are wild. You will rarely if ever actually see a feral cat. They avoid humans to all extent. And are comfortable in the wild. Stray cats were someones pet and somehow got lost, or removed from their family. Often a loud noise can make a cat run. Or being moved to a new location, without given necessary time to acclimate, will usually end with the cat trying to find it's way back to its previous home. Abandoned cats were purposely dumped by humans, and imposes great risks and dangers to those cats. Many will try to find their way home, or suffer in trying to find food, water and shelter on their own. Both stray cats and abandoned cats are, most often, indoor "house cats" and thusly, most are not prepared to live on their own. We need to educate people better with steps to prevent strays and accidental run aways, and impose huge fines and measures to prevent people from abandoning cats anywhere! It has been proven, time and time again, that we can control "homeless" and feral cat populations with TNR. It is the human side that causes the issues, with abandoning, and not spaying/neutering pets, that needs to be controlled. Or a great place to find answers about community cats is :Alley Cat Allies! Thanks for caring and wanting to help more animals!